I finally got a few blocks done with my red scraps. July is the colour Red. I find I spend the first half of the month sorting and cutting my scraps. These blocks are called Round the Corner and they are for the Squared Away sampler. This top set of blocks are the 10" blocks. This is the 7" blocks. And both sets up on the wall. There is the whole set of 7" blocks I have done. I could still go back and do Jan in light blue. They look so good together. Next up is flying geese. I do them for the migrating geese and I have extras for later. Today I just got started on the Migrating Geese Blocks. So you know what I will be working on this week. 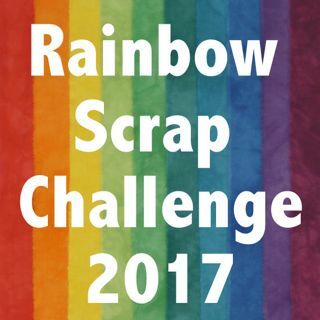 Looks like you've been having TONS of fun with your RED scraps!! Thanks, Always love your comments. I did not always have much Red but as Canadian wanted to do more Red, I shopped. I have a few large Red quilts on the go so many scraps. So I came across this post on one of the superscrappy link-ups. WOW your blocks are so scrappy! I'm also doing the Squared Away BOM, but I've only done a small handful of quilts so my scrap collection is quite small. My blocks only use one or two different fabrics (plus a background), but I am loving how super scrappy yours are! My green block is probably my least favorite, but I think yours is just fabulous. Beautiful work. I look forward to seeing how this looks when completed! Thank Mindy, You have the name of one of my dearest friends that is also one of the longest friendships I have had. Thank you for your kind words. I have quilted for many years and worked in shops so I also have a great stash. If I run low on a scrap colour I have been know to trade with friends and cut off a chunk from a large piece. I mostly make scrappy quilts. If one fabric will do 5 is better. PS And THEN I noticed that you are in Leduc. I'm just a little further south in Calgary! What are the odds! There are many of us Quilters every where. Yes good old home Alberta! Super blocks. They will all make great quilts. Thanks, I love to see many blocks on the wall. I love all of your red blocks. I am really looking forward to seeing your finished quilts with all of your scrappy blocks. Thanks, Great fun seeing what all the blocks are looking like together. I guess I did the block that had the most of the scrap colour to use, like with purple. I think some of them she showed some optional ways to do them. Great job working through the reds. Your squared away blocks are looking great.